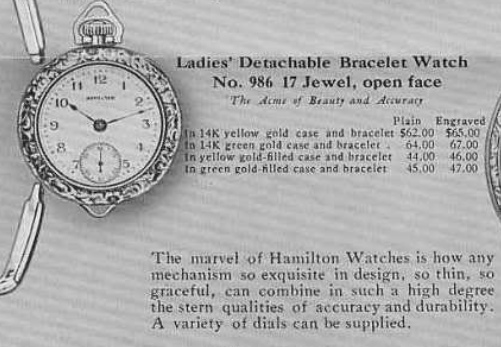 Hamilton's very first wrist watches were ladies pendant watches, starting in about 1915. Wrist watches were considered very feminine. Real men used pocket watches. Of course, the "Great War" proved that plenty of real men demonstrated wrist watches had their merits and by 1919 men's wrist watch models with larger 0-size movements were also available. Anyway, Hamilton was primarily a pocket watch company until the introduction of the 6/0 sized 986 movement. The 986 Bracelet watch came in both solid or filled gold, in green or yellow, in engraved or plain. You could wear it as a pendant from either end, or you could wear it on your wrist. It was introduced in 1915 and continued to be produced until 1923, when the movement was replaced by the 986A and ribbon-style straps were introduced. I've worked on a number of 986 movements because they were also used in men's models - especially during WWII. Hamilton's production was dedicated to the war effort but they were able to produce watches for civilian use by utilizing excess inventory of 986 and 986A movements. These WWII Cushions, as they are known, are easily identified by their 10K gold filled case. I like the 986 movements because they put the second hand at the 9 position - very unusual and very cool. I recently received a 986 Bracelet watch from a fellow collector, along with a couple of other watches in need of help. It dates to 1916, so pretty early for the grade. Since I haven't detailed this particular movement, I thought I'd show a step-by-step (for the most part) approach to an overhaul. As received, the watch was running but a bit noisy on the timer. It was definitely due for an overhaul. The model comes in a three-piece case, with a front, a back and a center section that holds the movement. The back is unengraved and in good shape. However, the lip to open the case back is very worn so it took some doing to pry it open. The 986 is a pretty movement. It's nicely damascened and the train bridge is ornately detailed. Other than the missing train bridge screw, it looks fairly familiar to later movements but this one threw me a curve ball... where's the set lever screw? Well, it turns out the 986 came in two setups... a negative-set movement (like most pocket watches of the day) where the stem is integral to the case, and a positive-set movement where the stem is retained in the movement by a set lever. I had only ever seen the latter setup. Once I removed the two case screws and pulled the crown out to the set position, I could push the movement out the front. In the shot below you can see the stem is still in the case - just like a larger pocket watch. This was the first time I encountered that with a 986 movement. With the dial and hands out of the way, you can see there is a series of springs in the negative-set movement that will keep the keyless works in the time setting position. When the stem in the case is pushed in (and held in place by the sleeve in the case) the springs are overcome and the keyless works move to the winding position. Compare the shot above to the shot below of the positive-set version of the 986 movement. Notice how the set lever and set lever spring hold the movement in the winding position. When you pull the crown out, the set lever pushes the spring and slides the clutch over to the time setting position. With the cannon pinion and hour wheel removed from the front, I'll flip the movement over and (with the mainspring relieved) I can start to disassemble the back, starting with the ratchet wheel and smaller winding wheel to the left of it. Now I can remove the screws that hold the barrel bridge in place and expose the mainspring barrel and center wheel below. The center wheel is partially blocked by the train bridge - that's good to note for reassembly so I put the center wheel back in before the train bridge. Only two of the three screws are present for the train bridge - that comes out next. With all the wheels out of the way, as well as the keyless works, the balance assembly is next to come out. The 986 has a single-roller balance and that means it's even more delicate than usual - so great care has to be taken at this point not to goof this part up. Once the balance is gone, the only key part left to go is the pallet fork and it's bridge. Before I put the parts in the cleaner, I'll check the mainspring... sure enough, it's set. The 986 doesn't run as long as a 987 to begin with, so a fresh mainspring is definitely a good idea. I happen to have a small stash of springs. The key with original springs like this is that they cannot have ANY rust whatsoever. If there's any rust, they will break but if they are rust free, you can probably still use them. My new mainspring will definitely have a lot more life and runtime than the old spring. While everything is being cleaned, I'll also take the time to replace the yellowed and scratched plastic crystal with a new glass replacement. The movement is running again - yay! One of the things I HATE about the 986 is one of the case screws is dangerously close to the balance assembly... see the open hole right next to the balance? After you get to this point, there's is nothing more discouraging than slipping the screwdriver off the case screw and jamming it into the hairspring or, worse yet, breaking the balance staff. Been there, done that. It's running a little slow, decent amplitude but YIKES - look at that beat error! 9.2ms is terrible. You absolutely need a timer like this if you are going to work on watches. I checked the position of the impulse jewel relative to the pallet fork and I thought it looked good. This was an unpleasant surprise. One thing I did not do is demagnetize the movement. So I passed it through my demag unit before attempting to take the balance off. Check out this difference. Much better amplitude and a beat error to be proud of. A little tweaking to the regulator brings the beat rate up a little and into the "excellent" range. Everything goes back into the case and I have to say, this little watch turned out really well! The bracelet is obviously not original but the watch will now run 30-36 hours on a full wind and keep excellent time. Not bad for being almost 100 years old! I did notice that the minute and hour hands were not moving while the second hand did - that's a sure sign of a loose cannon pinion. So I had to take the dial off one more time to tighten the cannon pinion on my staking set - but now the watch is "perfect". What is your store number, location, contact information. I have a watch that has been passed down to me that I have kept wrapped up and tucked away that I would like to be fixed. I didn't see any lady watches that looked like it. You can contact me through my Etsy shop or with the "contact me by clicking here" link above my photo in the upper right of this page. Hello, I have enjoyed reading this post and seeing the watch repair work that you do. Very cool. I have a question and tried the link up by your photo on this page, but a link is not associated with it. I would like to email you a question and photo regarding a ladies Hamilton watch I have (likely) from the 1920s. You can also contact me through Etsy and post photos that way.